This is a gift for Silky-M. 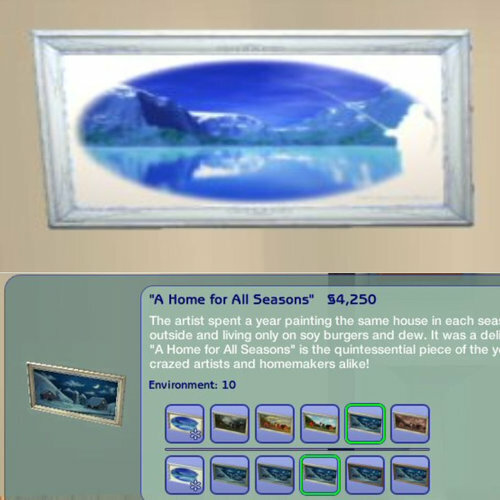 Seasons is required for this to show up in your game. I think the picture is beautiful and it looks great in my game. Thanks to Silky-M for sharing this picture with us and allowing it to be made for the game. 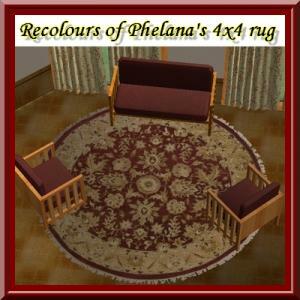 Rebecah posted HERE her fixed version of a lovely Antique Sofa Set that was converted from Sims3 to Sims2. You will need her meshes to have this set show in your game. I found this set and instantly wanted it for my game, I wish I could also have it in my house. I prefer to have matching sets and this one has everything, including a matching love seat created by our talented Rebecah. 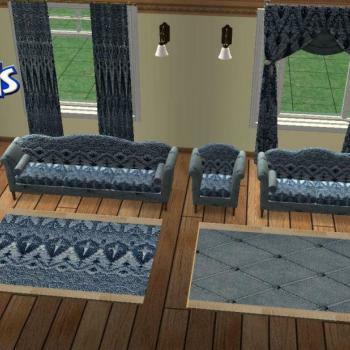 If you have the original mesh, you will need to replace the sofa, lounger, curtains, and chair with Rebecah's fixed meshes. After a long day at work, your Simmies can come home and relax in this wonderfully comfortable Sofa Set. I just wish I could too. I have more recolours coming soon. I hope you enjoy this set as much as I enjoyed recolouring it. Have fun! These are the rest of my bedding recolours. There is a separate rar for the Curtains from XMSims, Bedroom4. If you have my other recolours, you will not need the meshes as I included them in my previous recolours. If not, you will need Becks fixed mesh for the JonesiBedBlanket, HERE. The remaining recolours are grouped according to their colour, Yellow, Green, Grey, Pink, Purple, Red. Teal, and a special one from my sweet, but mischievous puppy, Jake. 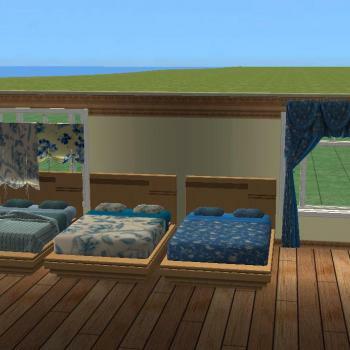 Enjoy and have fun redecorating your Simmies bedrooms. I found a sofa set that I just fell in love with and it just happened to be one that had to be recoloured in 2 parts. This one was so much fun as I mixed and matched patterns that I have. It's a sofa set from MTS, by Grapholina, but the site is down right now for maintenance so I am unable to provide a link at this time. Since I am fussy and want stuff that matches, I also did some curtains to match the sofa, using the fixed version Rebecah did of HL's Pinched Drapes. May your Simmies enjoy these sets, as much as I enjoyed recolouring them! Continuing on with my bedding recolours, I have a second set of blue beddings. As with my previous sets, I also made matching TieBackCurtains, and recolours of XMSims Bedroom4 curtain. I also made a recolour of the Jonesi Bed Blanket in case you want to add more decorating pizazz to your Sims bedrooms. All necessary meshes are included and the files have been compressed. Here are the recolours I did for beddings in black and white. I also made matching curtains, both the TieBackCurtain (which is a Maxis recolour) and the XMSims Bedroom4 curtain. 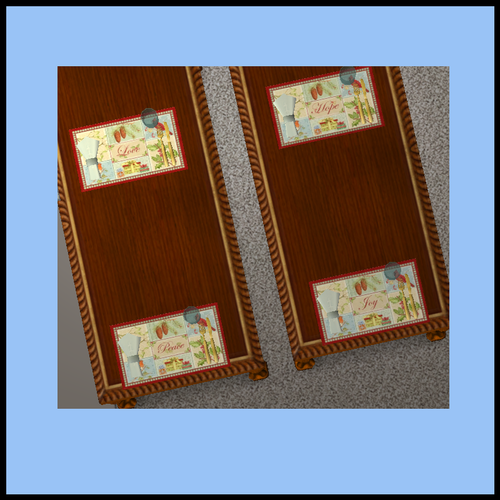 I also made a Jonesi Bed Blanket for this set, in case you want to decorate your Sims bedroom even more. All necessary meshes are included and the files have been compressed as well. I hope you enjoy these as much as I enjoyed making them. Today I have a new set. 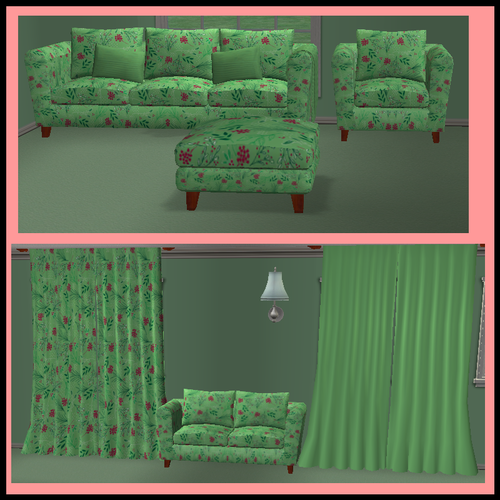 It is a recolour of HolySimoly's "Bette Sofa", HugeLunatic's @Sims2Artists "Pinched Drapes", om @Avalon, "Jia Curtain" and Echo's 3x4 floor rug. All the necessary meshes are included. Many thanks to Rebecah, who fixed the meshes, making it possible for me to recolour my favourite things. Thank you to everyone at Affinity who has helped and encouraged me as I continue to learn how to recolour my favourite things. 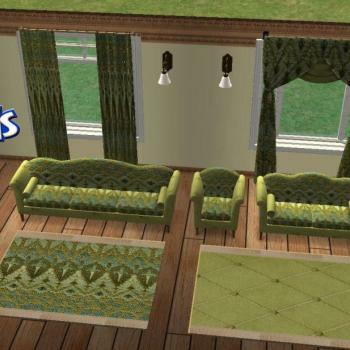 Here is my second recolour of Holy Simoly's "BetteSofa", HugeLunatic's @Sims2Srtists, "Pinched Drapes", om's @Avalon, "JiaCurtain" and Echo's 3x4 floor rug. Many thanks to Rebecah who fixed the meshes, making it possible for me to recolour my favourite things. All the necessary meshes are included. Thank you to everyone here at Affinity who has helped me as I recoloured these items. Your advice, suggestions and critique helped me to make a set which I am very proud of. I wanted to work on something easy today and saw that someone was requesting this in smithy's thread on MTS2. Thanks for creating the mesh Smithy! Some of the pictures come out really good but it is a pity that some of them lost some quality in the resizing process. I do hope you are not disappointed, Silky! 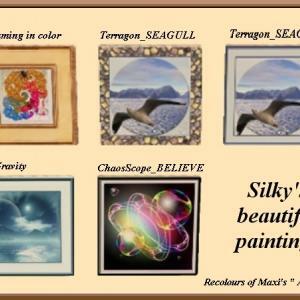 In the pictures you can see which Maxis picture I used for the recolours. I did these recolours in SimPe and used PhotoFiltre, Paint and Microsoft Picture Manager. According to SimPe no Expansion Packs are needed for them to show up. I have all the Expansion Packs in my game and all the Stuff packs, except Celebrations. I've made a few recolours of NinthWaves "Duplicity"
4. Sea Cottage - Night Life needed for this painting. It's a recolour of Maxi's "Two Dogs and an Olive"
Petunia and Ressu: Thank you so much for all your advice, support and help - I appreciate it very much! Rob for the wonderful frame mesh - thank you again! Thank you for this lovely new mesh and also for all your help, Debra! Please, comments and advice will be so welcome. My daughter, Am, for the sunset photo. 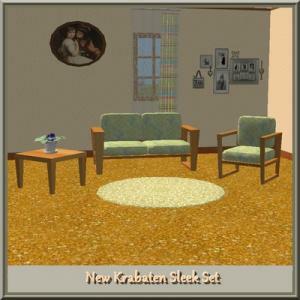 Marbi requested recolours of Krabaten's sets. I decided to do one set at a time and started with the Sleek Living Sims 2 set. 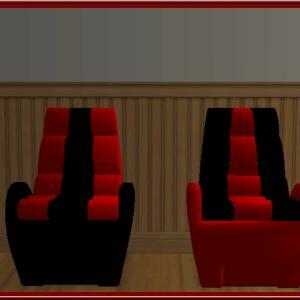 In order to let all the textures look good on both the arm chair and the love seat, I modified the mesh a bit. And most important, my Saviour, for the ability to do this. My Creator for the ability to do this. 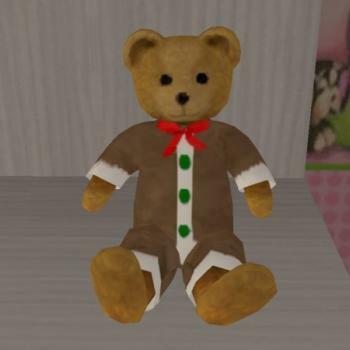 These are recolors of the base game teddy bear. There is a Xmas (Santa) teddy, a Gingerbread man teddy, a Pooh Bear teddy, a Nautical teddy, a Hello Kitty teddy, and a Shrek doll teddy. They are available as a collection. 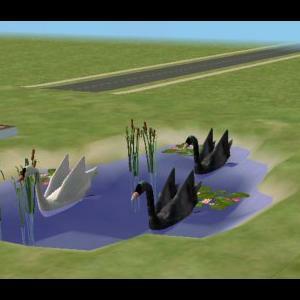 Made with Sims 2 Ultimate Collection and with the use of Simpe and CEP. These are recolors of Rebecah's wonderful hammer and peg toy. The freetime version is included. I absolutely love and adore this toy but never had enough recolors. 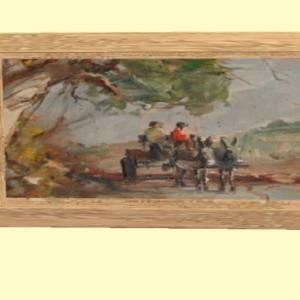 Nonni had made these wonderful wooden ones that I always used in my medieval game, but as far as I know, those are the only other ones out there. I decided to make more modern ones with bright colors for my modern day folder. They are all together in one folder now. 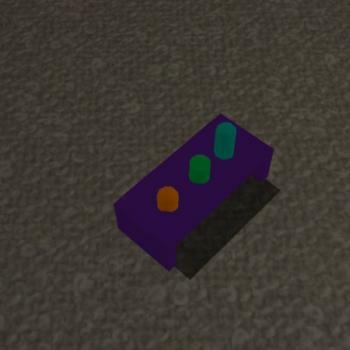 I didn't make a solid green one, as the original is a solid green, but otherwise there are wooden plus main color, and solid main color pairs for the rest of them. I used the freetime version of it, although I don't believe it makes any difference. Please correct me if I am wrong. Made with Simpe and Sims 2 Ultimate Collection. Thanks to Jules (again) for the pictures. 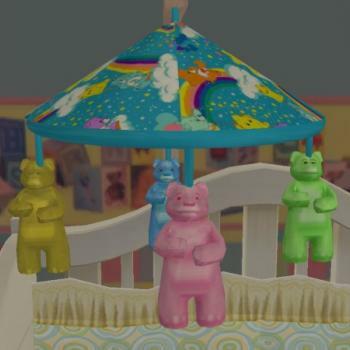 These are recolors of one of my favorite things, Rebecah's crib mobile. For years I wanted recolors of this wonderful item and finally decided to tackle it myself. They are now all in one folder, along with the crib mobile itself. 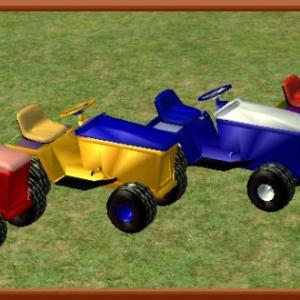 These are recolors of the Freetime activity table. This requires Irma's replacement mesh, which is included in a folder with the recolors, although you may also download it here along with other recolors. There is a Pooh recolor, a Mickey recolor, a Superman recolor, and a Hello Kitty recolor. Made with Sims 2 Ultimate Collection and Simpe. 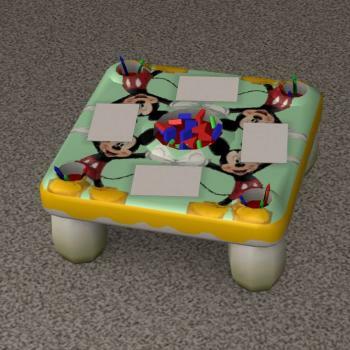 Thanks to Irma for a great replacement mesh that allows us to recolor the table! There are 2 files to download, one is for the sofa set and the other one is for the matching curtains. 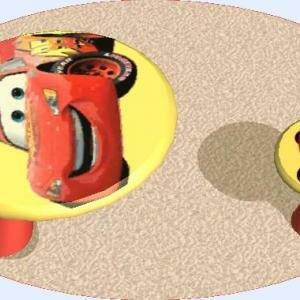 Both files contain the needed meshes. Please let me know via PM if you have a problem with this set. The thumbnail picture in my game is that flashing blue, but I can still click on it and get my recolours to work properly in the game. I only posted one pattern colour, there are various patterns and recolours. These are more recolours of SimAddict99 useable placemat mesh. 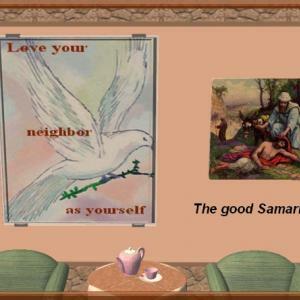 These are all Christian themed placemats and include Easter, Christmas and Thanksgiving. There are also placemats for children in this collection. The necessary meshes are included in the file.